Steven Bird's research concerns linguistic data management through the full life cycle from collection and annotation to preservation and access. With colleagues and students, he has been developing scalable methods for working with under-resourced languages in indigenous communities. 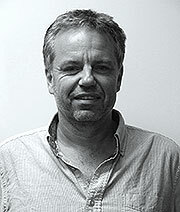 His career began with a BSc and MSc in computer science at Melbourne University, followed by a PhD in computational linguistics from Edinburgh University, completed in 1990. Since then he has worked at the Universities of Edinburgh, Pennsylvania, and Melbourne, and conducted fieldwork in Australia, Cameroon, Papua New Guinea, and Brazil. He has an ongoing appointment at Charles Darwin University. Visit Steven Bird's Web site.